Well, tomorrow is the final day of Inside Retail – Festival of Ideas, and I must say it’s been two exciting days of learning, innovation and really inspiring speakers. 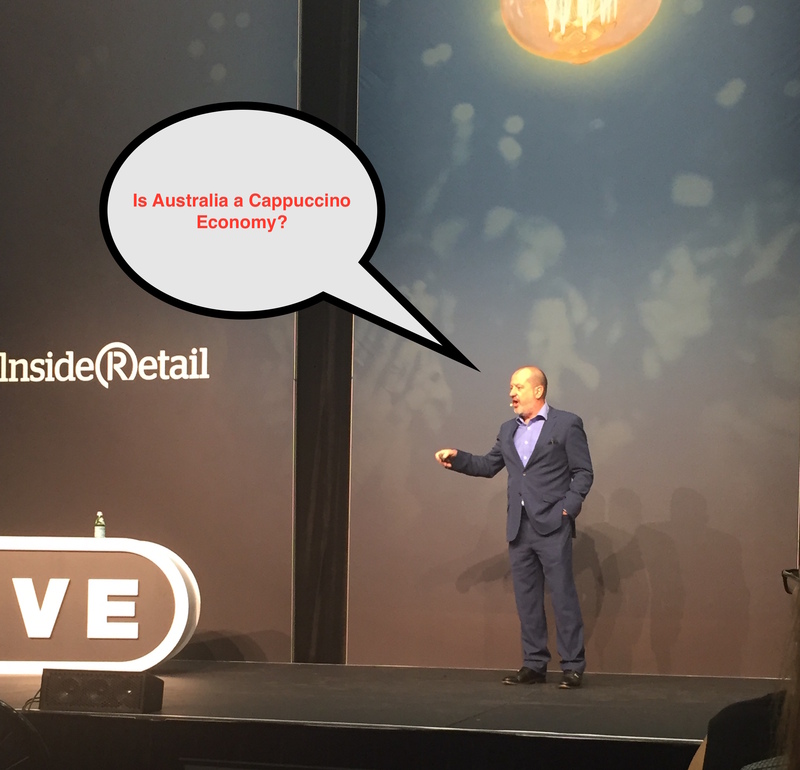 As the founding director of Retail Rockstars, I have the privilege of working with some of the best thought leaders and entrepreneurs in Australia…which I must say is only second to my LOVE of retail. But what I really enjoyed about this conference was that it was peppered with super-innovative smaller start-ups as well as long-established advisors and retail leaders like IBM and KPMG. It had a nice vibe about it all. Speakers have been great, one of my favourites was Russel Howcroft, you know the Ad guy on Gruen Transfer. 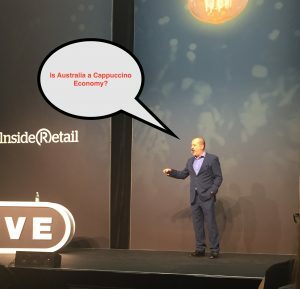 Well, he’s now the chief creative officer of PricewaterhouseCoopers talked about, “The Time for Tactics Is Over“, starting off by asking whether Australia is a “cappuccino economy”. “Surely there are more ideas in retail than a cappuccino, but that seems to be the operating theory that most of us are putting into business,” he said. He spoke a lot about product and retail experience, he used some really great analogies of movies to do this and followed up with an absolutely hilarious video on the importance of copy. I can’t even give it any justice here but involved two cool dudes buying a used BMX bike on eBay, using uhhhhmazing copywriting skills to re-sell the bike, noting among other things how many ‘rad tricks’ it performed and made 400% on it with the use of super gnarly copy-writing skills. Josh Sigel was another great speaker from overseas talking about connecting food experiences in unique and meaningful ways and partnering with your competitors. He was highlighting how consumers today appreciate your honesty and determination to roll out a better product for them. If they see your great at one thing and the competitor is good at another, strengthen your position with what you’re awesome at and work with competitors on what they can deliver really well. Really interesting topic by Dr Jenny Brockis, Where’s the buy button in your brain and what motivates us to buy? She went on to explain a number of truths I see play out in retail daily, she says, “We love that experience, we love that heady time when we go to the shops and make that decision we feel comfortable,” she said. Today was nasty and raining outside, but lots of fun stuff going on inside. Jim Fielding, an industry veteran of more than 25 years, recently was the CEO of Claire’s with 3,000 stores and now currently serving as global head of consumer products and retail for DreamWorks Animation. I know, how fun would that be? Well, he really stole the show today for me. He’s obviously a super creative bloke but full of actual examples and strategies he see’s and has worked on. He spoke on Creative Leadership in Disruptive times. He noted some great trends he see’s emerging although he mentioned that he definitely does not consider himself a ‘futurist’. 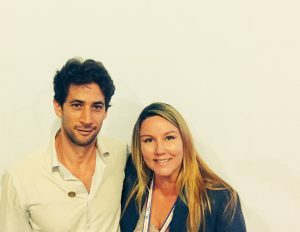 Either way, his presentation was exciting and brimming with fresh ideas and thought leadership. Unique – Small and unique one-off retailers are more interesting than bigger stores. He explains we all got a bit fat and lazy with finding unique products, It needs to be unique. Very edited very focused assortment. A great two days so far and more to come tomorrow. Let’s hope Cyclone Debbie is winding down and my flight back to Bris-Vegas is still on. Hope you found my highlights of the first two days useful and interesting, feel free to drop me a line in the comments below, I’d love to hear from you! Thanks for the great summary Amy. Very pleased to hear Russell Howcroft, Dr Jenny Brockis and Jim Fielding all talk about the in-store experience. This is an area that is ripe for innovation; and it won’t be just one innovation, it will be a combination of a number of innovations that retailers can adopt to increase in-store engagement and provide more reasons for consumers to continue to come in to the physical store. We designed the ili! app (see iiloveit.com) as a base for building in-store engagement, but then extending that engagement beyond the four walls of the store. It’s a phygital solution for Bricks & Mortar retailers. Let us know what you think. What an exciting couple of years we have ahead of us. Cheers.